A lobby of the launch party for Clarion met a friendly response as visitors arrived at the Royal Society of Arts. members of Unite and the other unions at Clarion gave out leaflets explaining the move to derecognise unions in the new organisation. 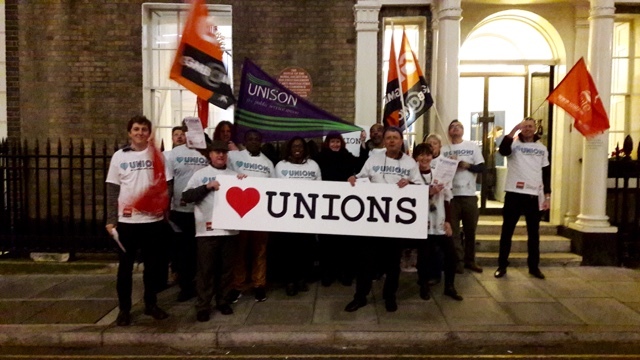 The new association, formed from a merger of Affinity Sutton, which derecognised its unions some years ago and Circle Housing has started its existence by attacking the rights of its workforce as we have reported. Unite reps in both organisations have met and agreed a campaign to defend workers rights and union recognition. Visitors to the launch event included senior politicians and many visitors expressed shock at the approach Clarion is taking to its workforce. A joint union press statement is copied below.